For those who have noticed my progress towards being a fly fishing guide, I have some big news. The Commercial Use Authorization permit from the Great Smoky Mountains National Park has arrived. That means that I can now accept bookings for guided fly fishing trips in the Great Smoky Mountains. 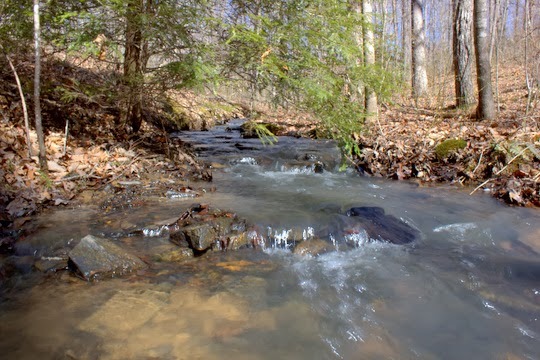 If you are interested in doing a trip with me there, or perhaps even on the Caney Fork or one of the warm water streams of the Cumberland Plateau, head over to Trout Zone Anglers and take a look around. While you're at it, send me a message and let me know about your interest. Dates are already filling so if you want to get on the calendar don't wait too long. With the cold weather again looming, I anticipate that the spring hatches will be sputtering along until March 6-10 or so when things should really bust wide open. Our best trips for overall numbers will be day trips into the Park's backcountry and those will be prime from late March through the middle of May. If you are willing to hike 2-4 miles (minimum) each way to get to your fish, you will have a shot at the day of your life. By summer, the mid and higher elevations of the Park will be fishing great. Days of throwing dry flies will be the norm at the higher elevations although dry/dropper will get us into more fish. Late night storms that rolled through just twelve hours ago have long since departed, leaving behind a beautiful late winter day. The temperatures are still not too cold but a touch of chill in the air reminds us that winter has yet to relinquish her grasp. In fact, later this week we could even see a shot at snow returning to the Cumberland Plateau and east Tennessee. While you wouldn't know it right now thanks to highs in the 60s today and 70s tomorrow, winter is going to be slow to relinquish its hold over middle and east Tennessee. This warm weather we are experiencing might get a few hatches going, and of course once the bugs start they can't really stop, but realistically it might still be a couple of weeks at best. As recently as 5 days ago it was looking like we might be in for an early warmup that would last long enough to get the hatches going, but now with a strong front moving in tomorrow night and forecast highs by the middle of next week in the 40s at best, I'm ready to tie a few more flies and wait for the main event. 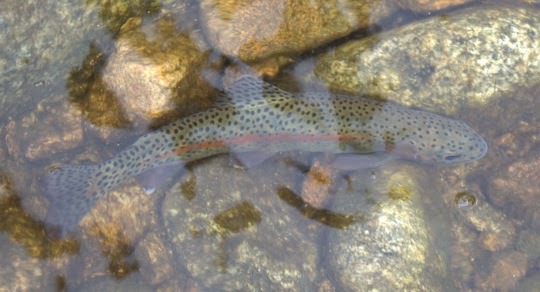 My friend James Marsh over at www.flyfishingsmokymountains.com reported a couple of days ago that some Quill Gordon nymphs he found just outside of the Park were nowhere close to being ready to hatch. This short warmup won't be enough to get the main show rolling. The 6-10 day and 8-14 day outlooks from the Climate Prediction Center indicate extremely high chances of colder than normal weather for the next couple of weeks. Here are the two graphics for those two time periods respectively. Yep, it's going to be cold still for a while. On the plus side, the cold weather should include fairly dry conditions which will allow time for the tailwaters to come down after the rain tomorrow. Also, I should mention that some of the best shad kills on the Caney Fork have happened in years that were cold later into March than usual. Plus, all the cold water now translates into happy trout that will stay healthy all summer on the tailwaters. As my last day in Colorado rapidly approaches, I was wondering if I could squeeze one last day of fishing in. A short hike combined with fishing seemed ideal. South Boulder Creek (SBC) just below Gross Reservoir is the perfect place for this type of trip so off we headed for another adventure. 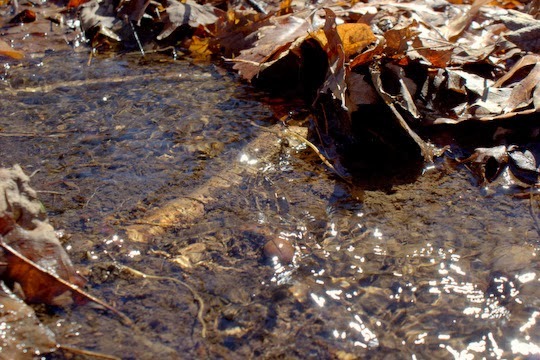 The stream was still running ice free thanks to the recent warmer weather. The winds that brought the warmer temperatures had me concerned but were forecast to die down in the afternoon. Reaching the parking lot and seeing only two other cars, I quickly rigged up with a small caddis pupa and a Zebra Midge. A small pinch-on indicator above seemed appropriate and then we hit the trail down. As the stream came into view, I was amazed out how much ice had melted since my trip last Wednesday. Of course, the first section you see gets a lot of sun exposure so that explained the lack of ice. Staying high above the creek, we turned downstream. I was heading for a section of nice pools that should hold plenty of fish in the winter. Looking back upstream, I paused to take in the beauty. The stream looked like silver ribbons running down over the rocks as the afternoon sun through light across the bottom of the canyon. Eager to fish, I quickly continued downstream. The pool where I had caught several fish last week already had another angler in it, but the pool just below didn't. After several drifts with only one small rainbow striking and missing the hook, I decided to continue downstream. I really like how this stream shot came out that she took. Notice that in this more shaded section the ice was still holding on along the edges. As I fished up around the bend, a nice slow pool looked like the perfect hiding spot for a trout in the winter. I tossed the flies and indicator in and then crouched behind a boulder to keep from spooking the fish. The indicator swirled around a couple of times before being pulled under. I set the hook and was happy to discover that I had finally hooked a fish! The rainbows here are incredibly beautiful. They all have these magnificent red stripes down their sides, even the little guys. It can be hard to believe that some of the stocked specimens I have caught in my life are even in the same family as these wild rainbows. With that first fish out of the way, I now wanted to catch one or two more before calling it a day. The next pool upstream seemed like just the place to do that. As I fished, I had lost track of where my girlfriend had gone with her camera. It turns out she was getting some more cool shots that I can't get on my own. Right after this shot, on the next cast, I tossed my fly over next to the boulder against the far bank. There just had to be a trout under that rock. Sure enough, the indicator dove and I quickly realized that the fish I was now fighting was in a different class from the first trout. As the fish ran around the small pool, I just let it run and tire itself against the spring of the rod. I didn't have a net and was taking no last second chances on losing this beautiful trout. After a couple of pictures, I released my new personal best rainbow from SBC. Even on a day when the flows are low, a few fish can be caught and a good time had. This fish was the perfect way to end my last fishing excursion here in Colorado for this trip. I was thankful for the two fish that had graced the end of my line. Even though I've moved back to Tennessee, I still love fishing in Colorado. Yesterday I made it out to the stream to battle the wind and hopefully find a few fish. 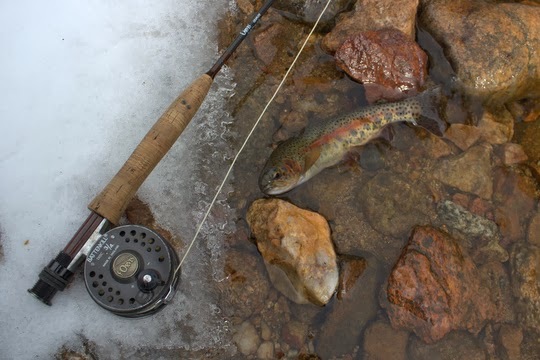 Initially I was thinking of hitting Boulder Creek, but at the last second I decided to make a run over the mountain so to speak and fish South Boulder Creek instead. I'm glad I did. When I arrived at the trailhead, I could see glimpses of the stream below and the most obvious feature was a distinct lack of snow and ice on the pools. Looking good so far! When I got down to the water after a short walk, I tied on a streamer to bounce around a couple of pools. When absolutely nothing seemed interested, I quickly changed over to a two fly rig consisting of a mysis shrimp pattern and a small midge. A little stick on indicator a couple of feet up completed the rig, and I got back to casting again. It only took 3-4 casts before the indicator hesitated. When I set, I saw a flash but missed the connection. Thankful that the fish were at least interested, I worked the pool a bit more before heading on downstream to some new water. I came to a favorite pool that reminds me a LOT of a pool in the Smokies on Lynn Camp Prong. The water flows through both holes in an almost identical fashion and it just so happens that it makes for some very tough drifts. I was fishing in hiking boots so repositioning across the creek wasn't an option. Thankfully, since it is winter, several fish were stacked in a slow back eddy on my side of the pool. Several drifts around that eddy and 3 fish later, I was pretty happy about how things were going. The wind was becoming increasingly annoying however. It was blowing straight down the canyon in fits and bursts that made casting frustrating from time to time. After another pool and another trout, I decided that it wasn't worth fighting any longer and headed back towards town. 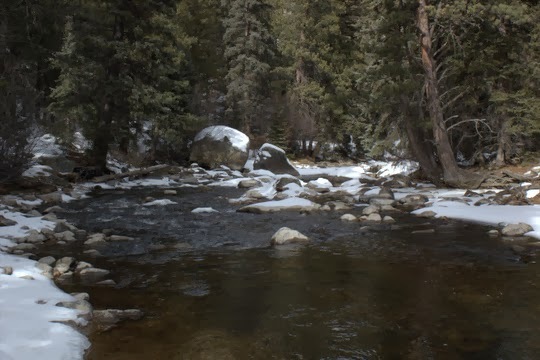 Stopping by Boulder Creek, I made a few half hearted casts with a streamer for old time's sake but there was very little open water. That should be changing in the next few days thankfully with highs forecast to be in the 50s and even 60s for the next week or so. I'm hoping to get another chance to wet a line while I'm here in Colorado, but the big news is that all my paperwork is back to the NPS for my Commercial Use permit to guide in the Great Smoky Mountains. I'm predicting that late next week into next weekend will see some fantastic fishing in the Park. More on that over at the fishing report on Trout Zone Anglers. Yep, I'm getting out today. I fully expect to have to break all the ice off the creek before I fish, but with a little luck I'll find some open water. A report will follow sometime late today or tonight. Hopefully there will be fish caught to report on. I'm here in Colorado for another week before heading home. The last of the paperwork is in so I'll be booking trips in the very near future. 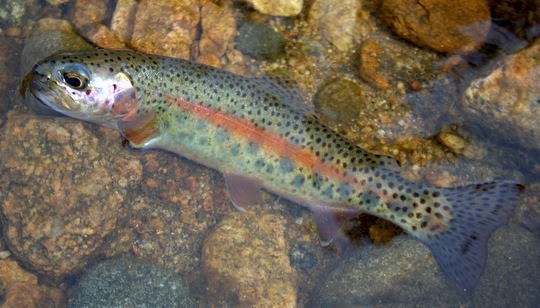 Expect a Grand Opening Sale over on Trout Zone Anglers for guided trips as soon as my permit is finalized with the NPS. 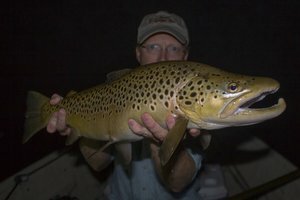 I've caught many nice browns over the years. 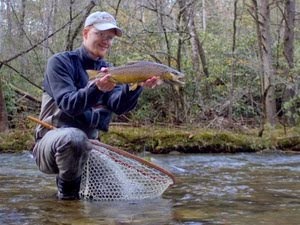 March and April have been particularly kind to me when it comes to catching big browns in the Smokies. 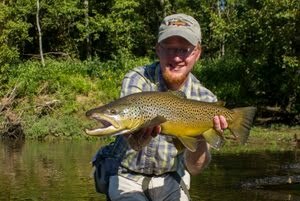 Here is one really nice brown from Little River from March a couple of years ago. The best part about this fish? I didn't actually catch it. Well, not exactly anyway. For those that have not read the story, go back a couple of years in time and check out this old blog post. It is one of the crazier fishing stories I've ever been a participant in. Today's entertainment is over on the fishing report at Trout Zone Anglers. I got to rambling about trips to Yellowstone in warm weather. 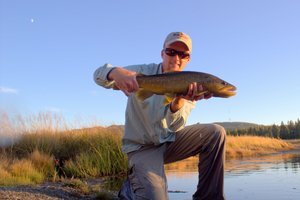 Enjoy the story and the pictures of the big brown trout! 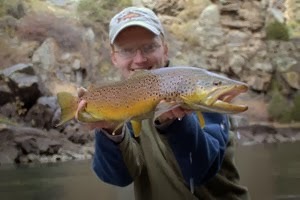 A new page has been added to Trout Zone Anglers. This one is a page of useful links. Right now, I have provided links to several articles I wrote a few years ago for the Little River Journal. 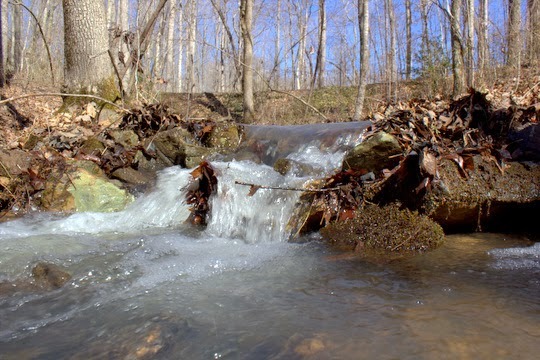 Depending on your mood, you can brush up on your skills, read fishing tails, or perhaps get inspired to journey further afield in your search for that untouched gem of a trout stream. Just don't explore this page unless you have some time on your hands. You will get the most out of each story if you can take the time to enjoy the read. Also, if you have a page that you think would be useful for my readers and clients and would like to have a link on the Trout Zone Anglers' page, please contact me and let me know why I should include your page. If you enjoy fishing tailwaters, I hope you made it to the Caney or are swinging by today. Just like that, we get a good rain and everything is blowing out. I'm guessing the generators come on tomorrow but we might, if we are extremely lucky, get one more day out of the recent lack of precipitation. 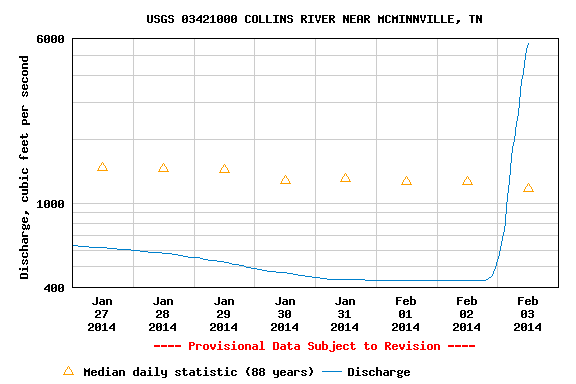 Here is a streamflow chart for the Collins River, a tributary of the upper Caney Fork at Great Falls Reservoir. Spikes like that are not what any of us want to see, but I'm sure it is probably better to be getting all this cold water now. The fish will appreciate it by late summer and so will the fishermen. Great Falls lake is showing forecast releases somewhere north of 10,000 cfs. I'm sure we can all guess what that will do to Center Hill dam and the Caney Fork tailwater. It looks like two generators around the clock for a while again. 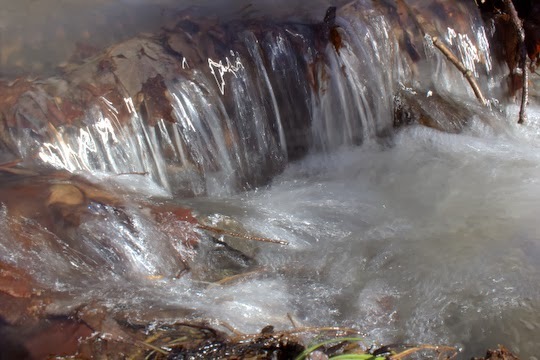 On a more positive note, the rain has cleared out the Smokies streams of ice. The ice buildup should be a thing of the past unless we get some more extremely cold weather. Now it is time to start thinking about the spring hatches. Head over to the fishing report on my new guide site to see a fly I like tying for the Quill Gordon hatches. For the Blue Quills and Quill Gordons, it is also hard to beat an appropriately sized Parachute Adams. I've had fish doing backflips (literal ones mind you) to eat that fly all day. For a really picky fish, I'm a big fan of Comparaduns and Sparkle Duns. Whatever pattern you decide to tie, just make sure you have plenty. When the fishing is really on, you can never have too many flies.